A pretty way to serve a large pie for a group. Make the pastry by placing the flour, sugar and butter into the food processor and process for a minute until it resembles breadcrumbs. Add the egg yolk and 2 tbs cold water and process briefly until the dough starts to clump (just a few seconds). Add a few drops more water if required then tip into a bowl and bring the dough together, pressing into a ball with your hands but do not knead the dough. Wrap in cling film and rest in the fridge for half an hour. Meanwhile, make the filling. Peel, core and chop the apples and place in a large saucepan with the juice and zest of the orange. Add the plums and stir well to coat then cook for a couple of minutes with 1 tbs water if required until just starting to soften. Stir in 1 tbs of the sugar and set aside. Roll out the pastry until it’s just a little larger than the top of the Natural Canvas Pie Dish. Using a pastry wheel or knife, cut into thin strips. 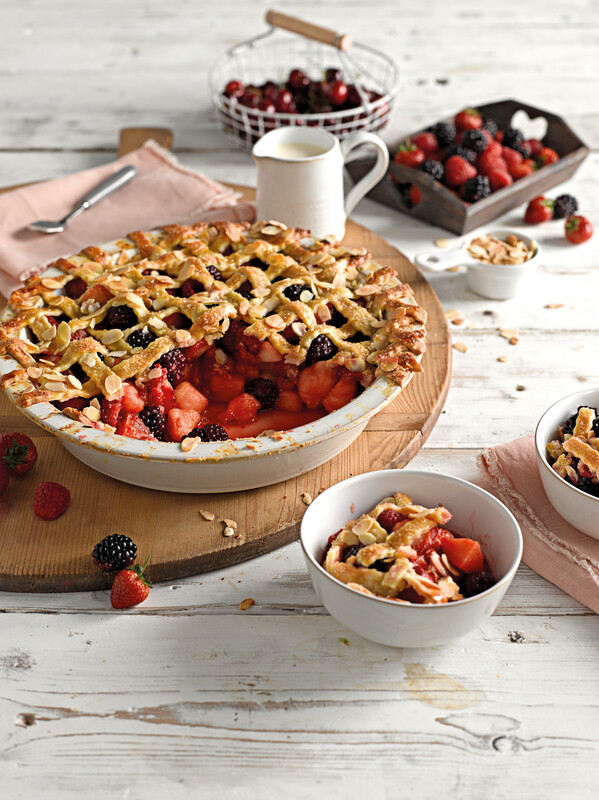 Very gently stir the strawberries, raspberries and blackberries into the apple mixture then tip all the fruit into the dish. It should fill the dish. Dampen the edges of the dish with a little milk then weave the strips of pastry into a criss-cross or lattice effect, allowing the ends of the pastry to fall over the edge of the dish. Trim the edges then brush with a little more milk. Sprinkle over the almonds and the rest of the sugar and bake for about 30 minutes until the pastry is golden and crispy. Serve with fresh cream, yogurt or ice-cream.